Anyone else still have a real wood burning fireplace? I am SO glad we do. 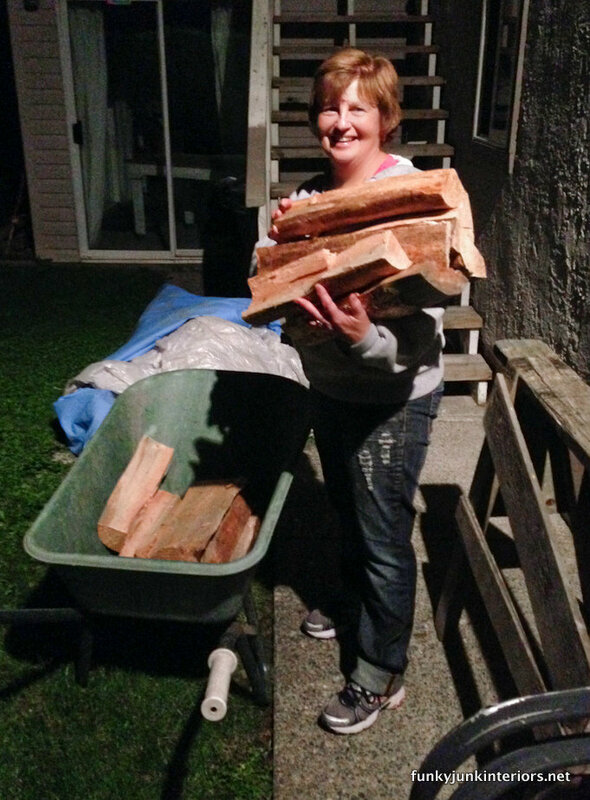 And I was even more giddy when my brother Les called about some firewood he wanted to send my way. But this winter will be different! 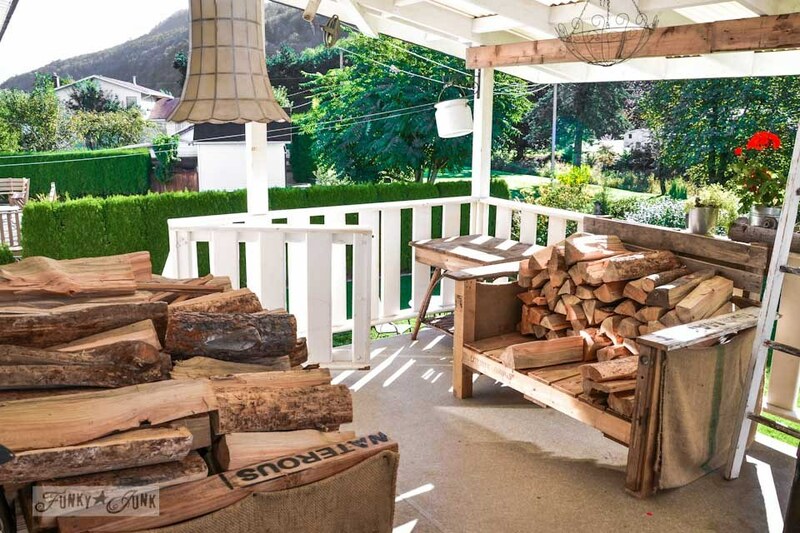 Yessiree, the pallet wood sofa and pallet wood chair are now stacked with that amazing wood that will keep us cozy all winter long. With no boots required. But it took many hands for this firewood to arrive here. Meet my sis, Wendy! She helped us carry and stack it all up those bazillion patio stairs. Thanks, girl! It was so easy and even FUN with you along for the ride! The first cozy fire of the season HAD to transpire. Just had to. That night. And a couple of fraidy cat newbies to all things fire didn’t quite know what to make of it all. Snap, crackle, POP! Boy that wood burns awesome! Skye was clearly the brave, and toasty warm winner and won the cushy spot on the trunk ottoman. The first cozy fireplace fire of the season truly signals fall is upon us. We do love our fires! And have even been found to roast marshmallows and hotdogs inside. Making dinner has never been so much fun! I love to light this thing up and sit really close, especially like I did tonight while Survivor played. 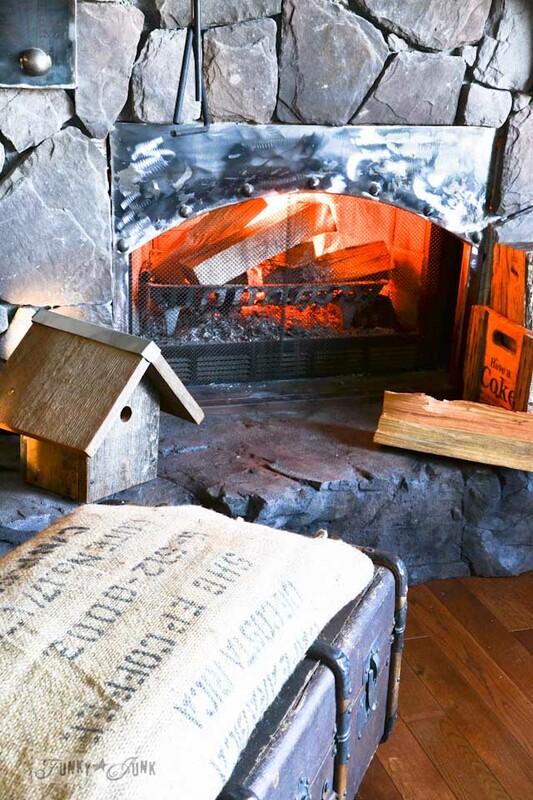 There is just no better way to enjoy the longer, cooler evenings than beside a fireplace. Thank-you Les and Dar for the fabulous wood! And for Wendy and my boy to help get it home. The only thing left to do is obvious… time to stock up on more hotdogs and marshmallows of course! 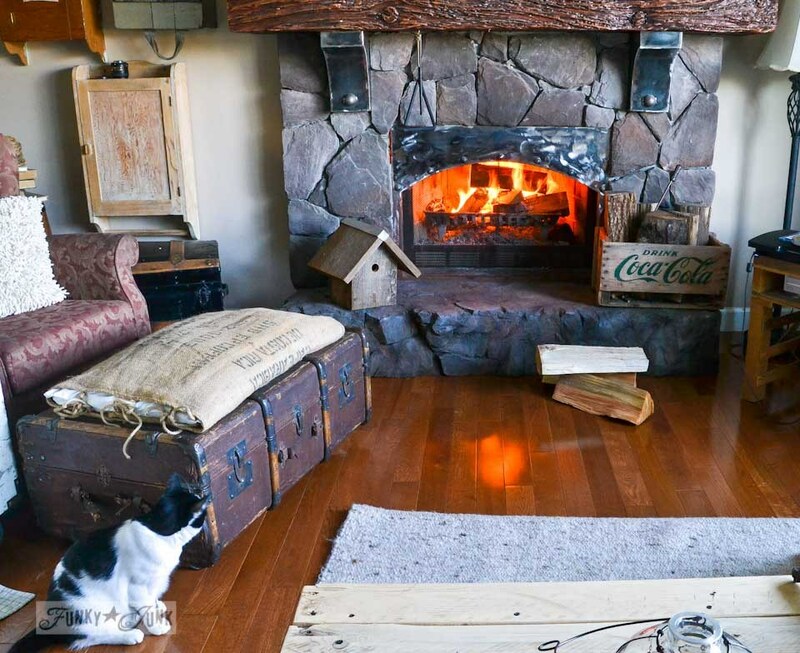 Do you use your fireplace quite often? Gas or wood? 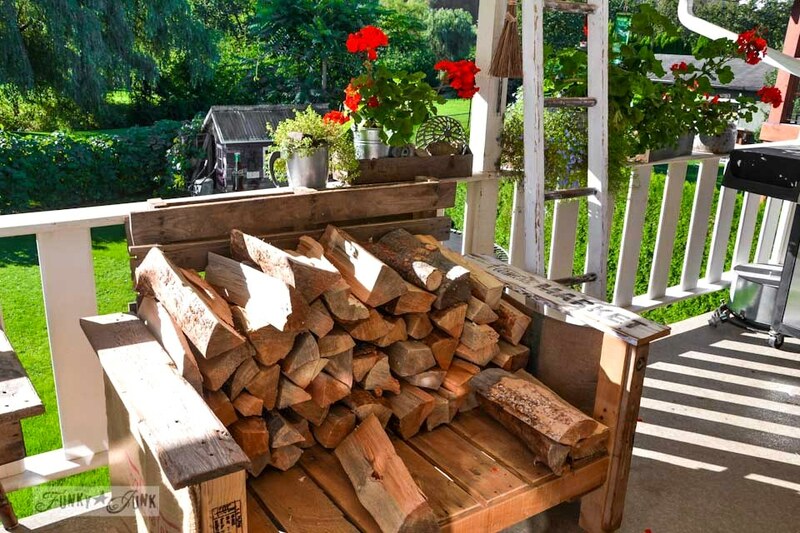 I love how you used your pallet furniture to stack the wood. Like you, our wood is up by our shed and it is no fun to trek up the hill in the snow to get it. The Mr usually brings in two wheelbarrow loads filled over the brim and parks them in the sunroom. ( Our sunroom is only a 3 season room ) We have a fireplace int he livingroom, but don’t use it much as we don’t use the livingroom very often ( no tv in there haha) , but do use the family room in the basement area. There is a wood stove down there and that is what we burn the wood in. During the day, we let it simmer down there so it is at a comfortable level to be there and at night we pack it full to heat the entire house. Speaking of using the fireplace, it is that time of year where the Mr need to get on the roof and clean out the chimney. We do it every year. Each seems that each year in our area, someone gets a chimney fire and that makes me nervous. Make sure your chimney is clean. 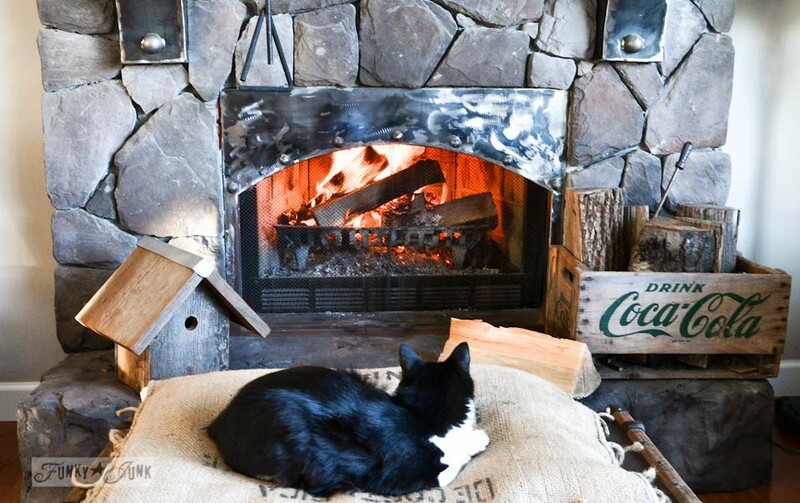 I’m sure as soon as your cold weather hits those kitties will know the best place to sit… and you can be sure it will be close to the glow of the fireplace. I miss an open fire… our winter is so mild we don’t even have heating! 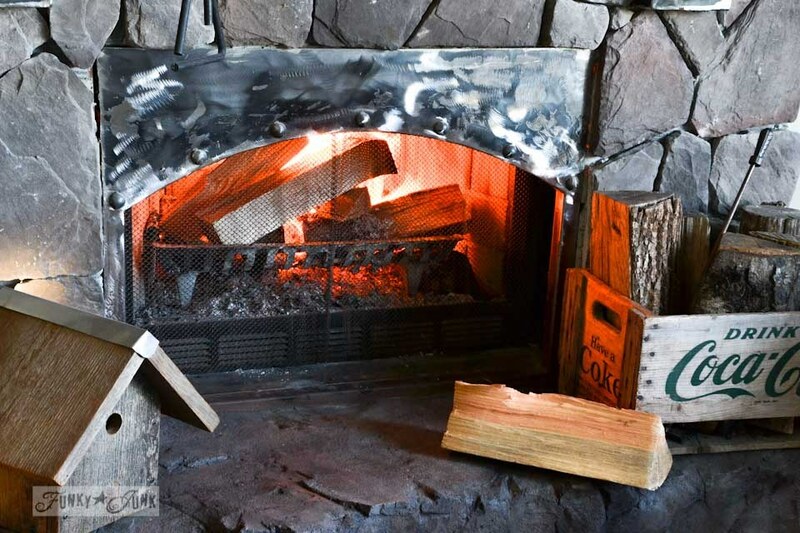 We use one of ours all the time (we have 2 wood burning rumford inspired fireplaces). When we built the house the plan was to be able to burn both simultaneously. They throw so much heat it’s one or the other. Love using the fireplace popcorn popper. We also have a wood stove in the basement which we use to heat the house. Our oil heat is our back-up. Good morning, what a nice surprise waking up to your fire! We have two fireplaces, one in our kitchen dining room and one in the family room for those after dinner experiences. On mornings like these, cool and in the forties, after brewing the coffee, I “compose” the kitchen fire and bask in the warmth, light, sound, and fragrance of the resplendent wood fuel. It is sublime…. I just LOVE the smell and feel of a wood burning fireplace. We heat with ours and have propane as a back-up. Nothing beats wood. I so enjoy your posts and think of you as my muse. You inspire me to take risks. Thank You and keep on Junkin! We have a wood burning fire in our living room and I love sitting by it on a cold winter’s night. But in the warmer months, we enjoy our outdoor chimenia (?) all the time. We extend the season by covering ourselves in a blanket and enjoying the fall chill. makes me want to light one tonight! Love! The ironic thing with Colorado is most of the state is banned from wood burning (pollution). So, everyone pictures large, log burning fireplaces when they think mountains and most fireplaces are gas! Skye looks very comfy cozy on that cushion in front of the fire. 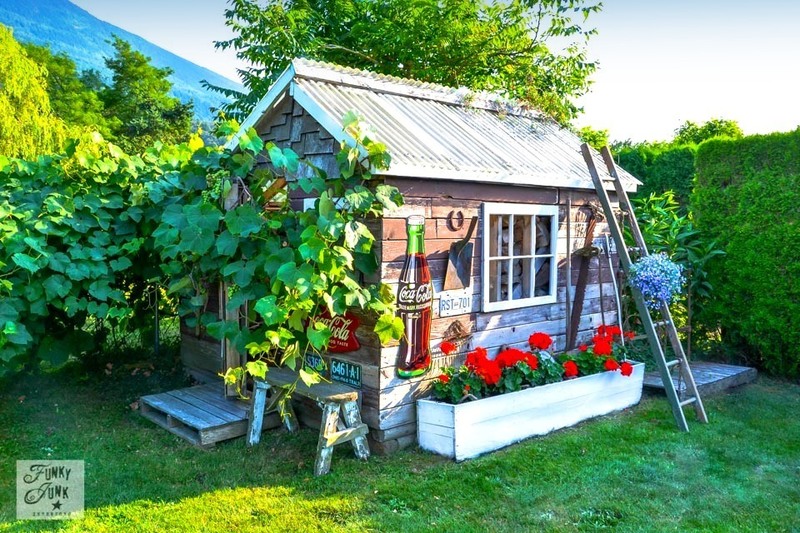 great wood story! just knew Skye would like the fire ( the bolder one) but what till Lake figures it out they will be fighting or piling upon the otoman! once again great wrting thanks Donna! We have a wood burning fireplace (with gas starter). Unfortunately we can’t use it because our oldest daughter has severe asthma and fires really trigger her symptoms. (She loves fires, too). i miss my fireplace. we used to live in ohio, and now we live in north carolina. we COULD use one here occasionally, but the house we are renting doesn’t have one. pout… enjoy yours for me! 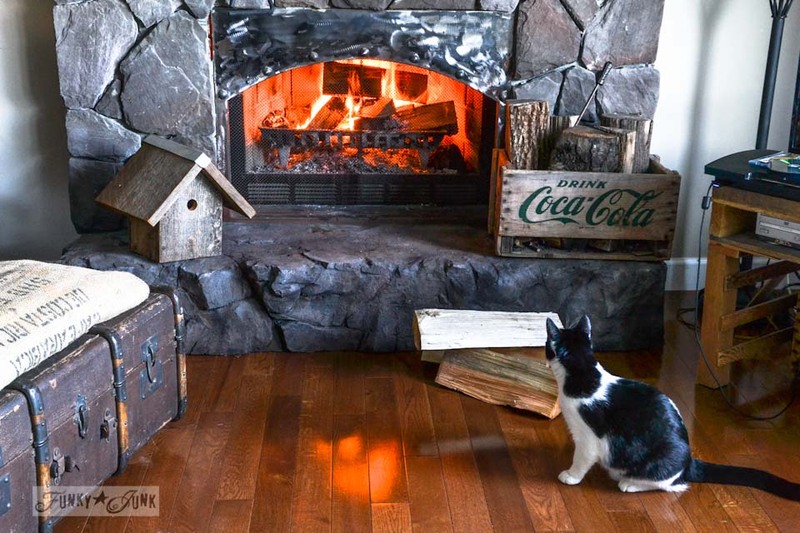 Yours is awesome and your kitties so cute investigating their first fire. Oh, how I miss my wood burning fireplace! 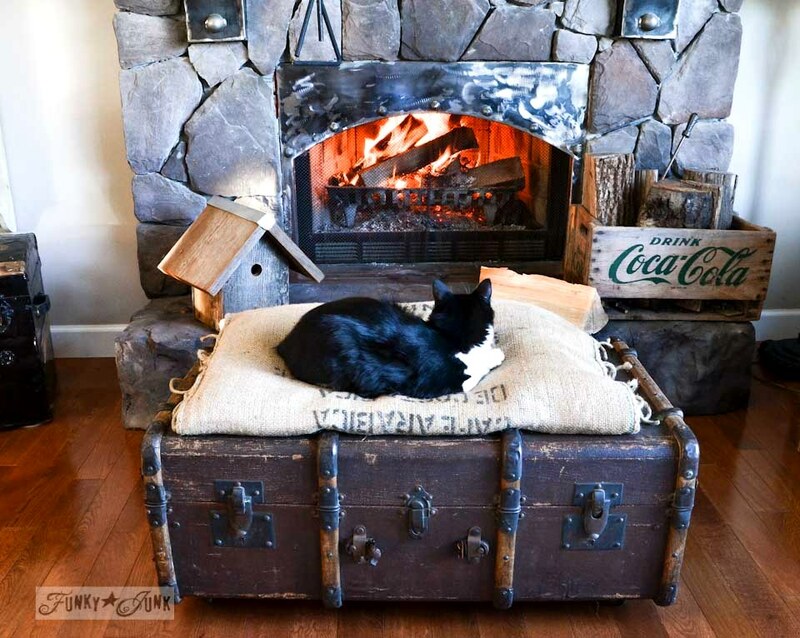 Love the kitty photos 🙂 Genius fall/winter use of your pallet furniture. So am I the only person who is concerned about the combustible materials sitting on your hearth, so close to that roaring fire? Yes, I probably am. When I can’t find something to worry about in my own life, I worry about others!! Be safe. Good call Linda! I’ve already checked it all out and the heat doesn’t even reach up above. Guess the hearth is so large it holds it back. Thanks for looking out for us! Oh how cozy. Can’t wait till it gets cool enough to light up our fireplace. I can totalllllly relate to the thrill of a wood burning fireplace/woodstove. I also agree with all the previous comments regarding why we love a good fire, however, I would also add the sound a wood fire makes when while it burns can’t be matched or easily duplicated! We have a cottage on an island in central Ontario and our only source of heat is either electricity (very expensive) or our woodstove. I have actually become somewhat of an expert using the log splitter in order to keep enough wood on hand to heat the cottage. 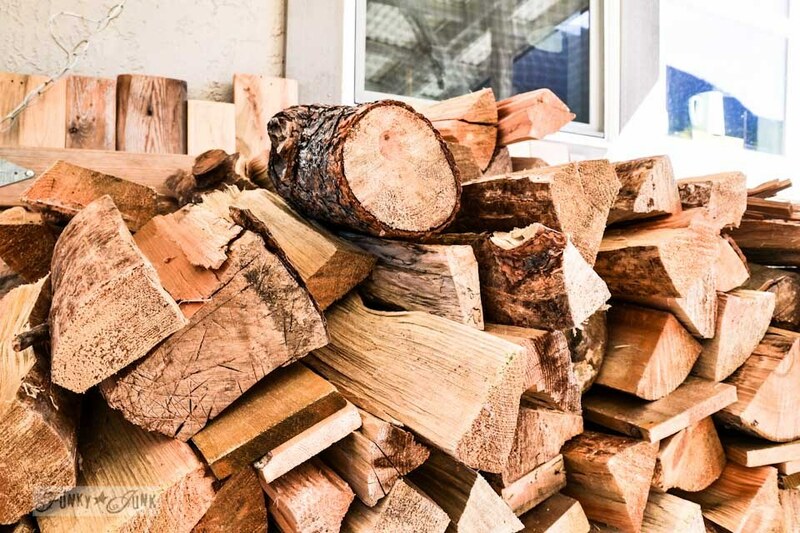 Something you might want to keep in mind regarding storing your firewood is to ensure there are no bugs, ants or cocoons in the firewood or it might be a problem storing the wood on your wood furniture or inside your sunroom. Also, I can’t tell from your pictures but if you don’t have glass or metal doors on your fireplace I would recommend you consider installing them if you intend to use your fireplace. 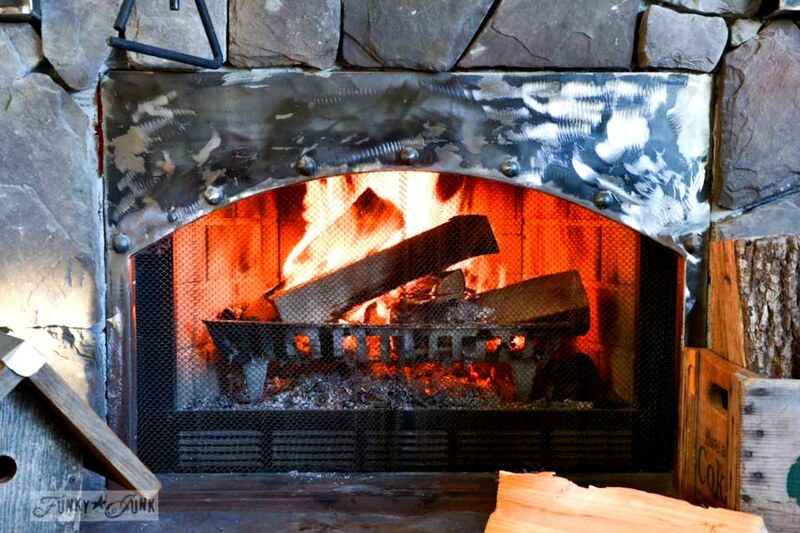 Based on personal experience burning wood in a fireplace without a door will result in a layer of soot being deposited on everything in your house which will add to your cleaning and dusting duties.